With a renewed economic dynamism, Cambodia has started a new growth cycle. Growing from an economy that is very dependent on raw materials and tourism, Cambodia is now engaged towards industry and export. Aiming at helping local businesses and foreign companies, the Cambodian government has set an attractive tax system. The Cambodian economy's renewed dynamism stimulates the construction sector; its gaming sector, growing industry, agricultural and natural resources complete the country's activity. These come in addition to a strong tourism sector, notably attracted by the world famous UNESCO World Heritage sites of Cambodia. 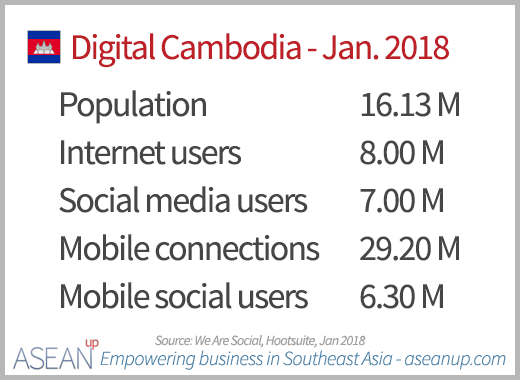 The improving infrastructures and spread of mobile phones have helped Cambodians to access the Internet and digital services. With low trade volumes, Cambodia aims at more trade through the development of industry and improved exploitation of natural resources. Symbols of its ancient and rich culture, two sites in Cambodia have been classified by the UNESCO as World Heritage sites for Humanity. Cambodia has one of the world’s most famous World Heritage Site with the temples of Angkor in the surroundings of Siem Reap, in addition with the Hindu temple of Preah Vihear. Cambodia is a business-friendly country, with a progressive but low income tax, a low corporate income tax and low equivalent to VAT which make it attractive for work and business. Other taxes are also in the lower range, further enabling professionals and companies to consider Cambodia for their operations. Google has just created an amazing resource to explore the temples of Angkor with a special “Street View” website of Google Maps. In this first-person 3D reconstructionfrom assembled pictures, anyone can visit the most famous temples of Siem Reap and view in great details their amazing architecture and art as if they were there. A series of challenges affecting China, Thailand and Vietnam have attracted investments in factories in Cambodia, stimulating the economy, the rise of wages and development of skilled labor. This video from Bloomberg presents the interests and benefits of the developing manufacturing sector in Cambodia. Amazing video taken shot by a drone in Cambodia – by Roberto Serrini, useful for embedding in any website presenting information on travel in Cambodia as well as NGOs that could be interested in showing the Cambodian rural life. 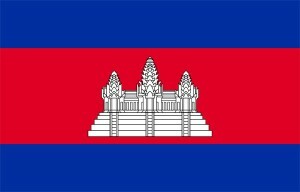 Here are the flag and royal arms of Cambodia at various sizes to be used in your website, blogs or other visual presentations.